A NEW $200,000 ‘wake-free’ boat has set sail on the Tweed River. Tweed resident Trevor Payne designed the innovative boat, which will be used for recreation and rescues. When launching the boat for its maiden voyage on Monday in Fingal, he said the project took years of planning. The boat, which has no name as yet, has a flat bottom hull, which adds air lift under the vessel reducing friction. At cruise speeds, in the 70km per range, the vessel generates a “barely perceptible wake or bow wave”. Excessive wake causes erosion to the riverbank and has been a controversial problem for waterway authorities and the Tweed Shire Council. The boat is also a low danger risk. It can be configured to have its fuel load outside the hull, within the special ski housings, eliminating fire or explosion within the hull. The boat’s commercial potential attracted $96,000, in Federal Government funding for Mr Payne’s public ally listed company, Sea Ski Australasia Ltd.
“It was the Australian Government, through the department of Industry’s Grant Assistance Program that shouldered the bulk of the financial burden of making it a commercial reality for us,” Mr Payne said. The vessel can be considered for roles in rescue, coastal surveillance, and tourism, servicing off-shore installations, recreational pursuits and water taxi services. 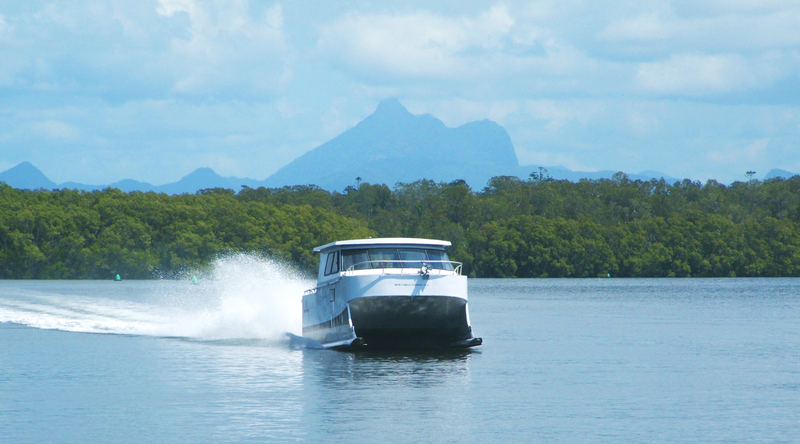 Mr Payne said if the prototype is successful on the Tweed River more will be made for various commercial purposes. He said the boat was made from Ullrich Australian aluminium, rather than the Chinese alternative.